You Found Us...the Storage Shed leader in 'Quality for Value'. FAMILIES has played a key role in marketing Outdoor Living Products for over 17 years.... Giving us the experience and trust needed among the top manufactures in the industry. This relationship provides you, our customers and friends, with only the best freeing you to enjoy your family, and not be saddled with disappointing products. This allows us to focus on building high quality sheds that match or exceed other 'High Quality Series'. All for prices that are competitive with most economy sheds. Absolute 'can't be beat' value!! Starting with only the best lumber, all 2x4 stud walls and rafters 16" OC with ½" ply wood sheeting and pressure treated 4x4 runners, pressure treated 2x4 floor joist 16" OC topped by exterior grade heavy duty plywood floors, to ensure lasting quality. You have to come to see the difference! Pick your colors, door sizes, window & door placement. Add flower boxes or shelving! We specialize in designs to compliment your own unique style. Sound complicated? Let's start designing together today, and you'll soon realize we make it 'easier then it should be' to build the shed of your dreams. Have questions about permits, site prep or delivery? 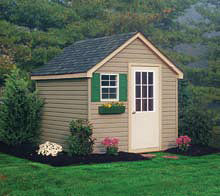 You came to the right place, we would be glad to answer all the questions or concerns you may have about your new shed. We can even come to your house and look at the possibilities of delivery to your yard. Our family business is built around solid values and good customer relationships. We've been perfecting it over the last 17 years. Dad always says....'a happy customer is the best advertisement'. Come experience what that means today! I have grown up around the construction industry and with my experience in many different types of construction I'm ready to answer all your questions and explain in depth the quality of our sheds. I've seen the way many sheds (and houses) are built. Many contractors who come through our offices won't put their money into any shed but ours because they see the difference. They know first hand longer durability translates into a much better value! 5 Year No- Hassle Warranty! We have confidence in the sheds we sell! You can now buy without hesitation. We mean everything! Hinges....Door latches....Workmanship--and the list goes on.If it came with your shed. it's covered. period. done.. Plus the customary manufacturer's warranty on your siding and shingles. But do yourself a favor. Come take a tour of our sheds first. We have a 'No pressure policy'. Our sheds sell themselves. Let us answer your questions!